This Beautiful Grace: Planning for Advent: Why? The first Sunday of Advent is quickly approaching! Sunday, November 27th marks the first of four Advent weeks leading up to Christmas. Why celebrate Advent? It's certainly not required or necessary for a meaningful Christmas season. So why take the time or energy to celebrate or recognize the Sundays of Advent? For our family, I think it provides three things: Purposefulness, Mindfulness and Fun. find pockets of purposeful time. Hope (faith), Peace, Joy & Love. Fun: It's just plain fun. Sometimes it's an evening of crafts and activities. Sometimes just a quick, special snack. Sometimes just a candle lit at Sunday dinner. And sometimes the candle gets forgotten in the midst of all the travel and family gatherings. But that's okay. We don't get our bloomers in a bunch. It is just one of those little traditions that creates a sort of glue for our family. We are family on purpose. We have fun. And we celebrate a lot - the big things and the small. One thing's for sure - planning for Advent (or any celebration/tradition/holiday) shouldn't become a stressful burden. There are some years when we just simply don't get to it. Many times we will just do something quick and simple, just to pause a minute and remember together. Flexibility is essential or celebrating can become a burden instead of a blessing. Sunday, December 25: Christmas Day! 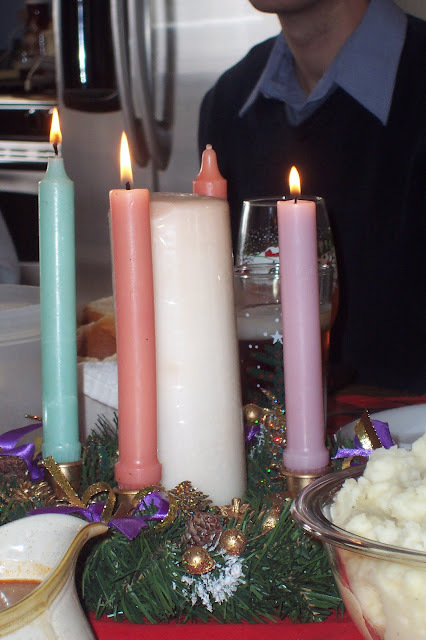 Light the "Christ Candle" in your Advent Wreath! A free Advent Jesse Tree Book from Ann Voskamp. Are you in the babies-and-toddlers stage? Check out this kid-safe wreath! I'm pretty sure this would fit in a diaper bag as a quiet teaching toy during the services of the advent season. We got our advent wreath at the Christian bookstore in Alabama years ago. 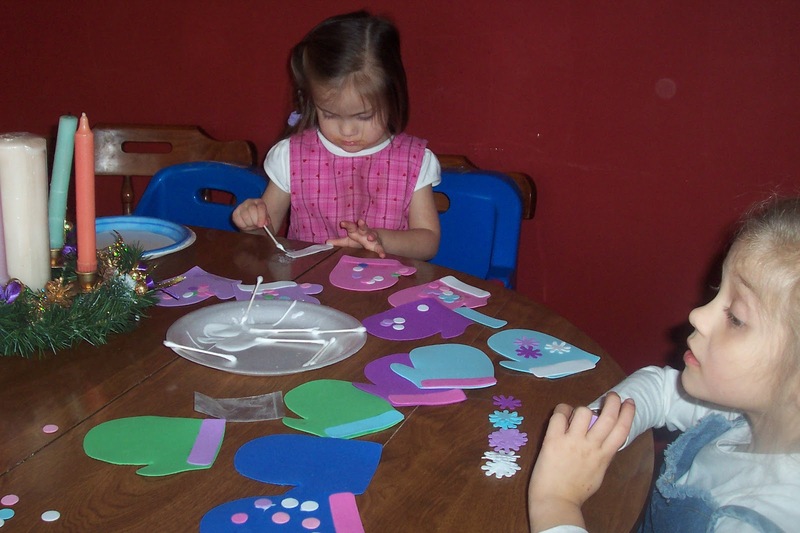 You can expect to pay at least $20.00 for a decorated advent wreath but there are cheaper versions. Another idea is to wait until they go on clearance after the season. In the meantime, use a plain wreath of greenery and just place four candles in cheap candle holders from the dollar store around the inside of the wreath. And the easiest-peasiest way to celebrate Advent? 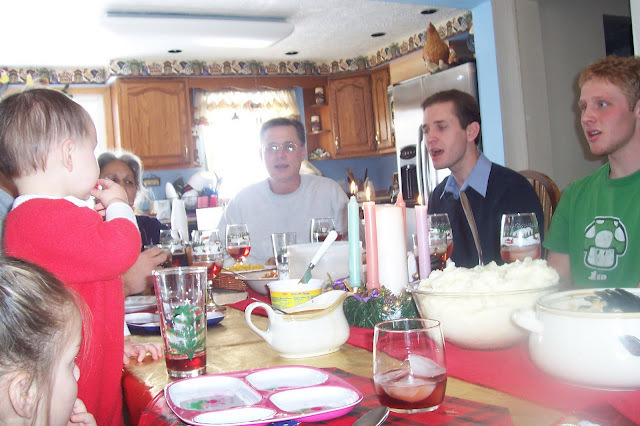 Each Sunday (or anytime during the week), light a candle at a meal, or drink hot chocolate in the evening and talk briefly about the theme or ask everyone in the family to give one thought about the theme of the week. You don't even have to have a fancy advent wreath. And I have learned that we can certainly do without the special-colored candles. We usually just pull out whatever is in the candle cabinet that will fit in our wreath. I have also learned that celebrating these special days is much more do-able and enjoyable when we go with the flow and keep it simple. If it has to happen on a certain day and in a certain way every single time, chances are it won't happen at all. At the very least, we can talk about it with our kids on the way to church. Explain that Advent simply means "coming." Tell them the theme for the week and remember the reason for the season together.